Website visitors are hard to win but easy to lose. Driving traffic takes a lot of time and energy. We all work hard to pull in visitors from social, search and email marketing. Our Analytics count these visitors one-by-one. Driving traffic is like carrying water. Do it every day or your results dry up. But a lot of websites are like leaky buckets, and visitors just pour out of them. This post is about integrating social media into your website without losing visitors. Here’s how to find (and fix) one of the most common social media traffic leaks. I love social media. I love the direct connect with real people. I love the speed of interaction. And it’s a good (but spikey) source of traffic. Traffic from social networks is good. Visitors leaving to go to social networks is bad. Visitors leave websites and go to social networks all the time. That’s normal. But you don’t want to encourage it. Don’t make it easy for them by inviting them to leave your site. Do you really want people to click that? What’s on the page behind that click? Anything irrelevant? After clicking that link, is the (former) visitor closer, or further from your contact form? Are the likely to come back? Sending a visitor to a social network puts them in the hands of a profit-driven, billion dollar company that is totally focused on keeping and monetizing that visitor. Is that good for your marketing? 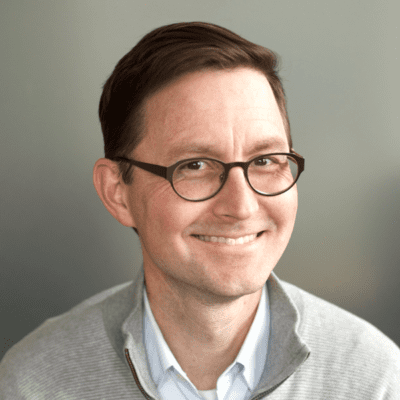 A quick study done by Phil Nottingham of Distilled found that the clickthrough rate from YouTube to company websites is a measly .7%. In other words, fewer than one in a hundred visitors will make it from YouTube back to your site. Still want to send them to YouTube? This video is on YouTube. Do you really want to send your visitors to a website that has this video? Notice how I didn’t make that cute little guy clickable. I would have lost you for sure! Clients want them so designers add them. Most sites have social icons on their home pages. A study by Crayon found that 75% of websites have social media integration, with home pages featuring one or more social media link. Different industries have websites that integrate with social media at different rates. Non-profits and sports companies add them the most. 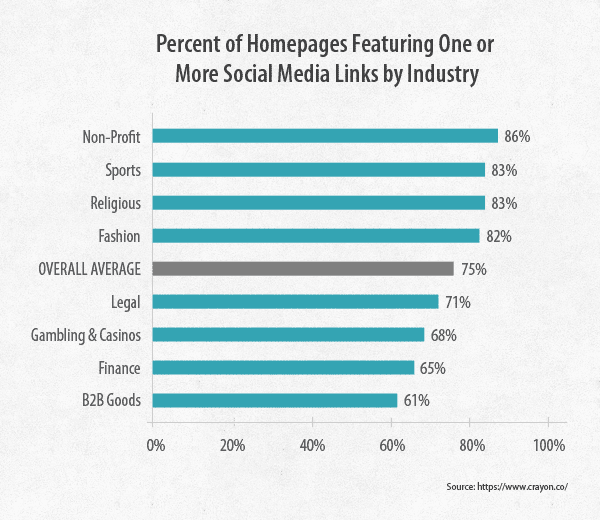 Regulated industries like financial, legal and gambling are less likely to add social media links. No surprise. Not only do sites add this leak to their bucket, but many sites make the leak as big as possible. They add big, colorful candy-like social media icons to the header of every page. The colors often make these buttons the most visually prominent part of the page. How is that a good thing for your traffic? UPDATE: We did research on the top 50 marketing sites and learned that 26% have social media icons in the header. Here is the full report on web design standards. Better yet, move them to the footer AND grey them out or change the color. Now they can be found by people who are looking to follow, share and mention, but they’ll leak as little as possible. Notice how the signup button (which is a higher-value integration for the brand) is more visually prominent than the social media buttons? Some sites will actually put a big Facebook button on their homepage carousel or as the featured image. Yikes! We don’t need to say much about this one. I can only assume that these marketers are more confident in their ability to engage with people on Facebook than their own website. There are lots of ways to add social sharing buttons. One way is to grab one from a company that makes them. Often these are WordPress plugins, which make them super simple to add. But be careful. These buttons sometimes add a little ad for themselves in the shared post. That may leak visitors away from your site and toward the company that developed the button. Ideally, the share buttons are customized to mention your website and brand, not just the link. If you click the Twitter share button at the bottom of this post, you’ll see it adds a mention for @orbiteers to the tweet. Leak fixed! Need a little help making this work? Social Media Examiner has a great post on how to create custom social sharing buttons. So when should you send people to a social network? There is definitely a time and place to send people to Facebook, Twitter and YouTube. It’s when that social network is a key part of your marketing strategy. Before you punch holes in your bucket, ask yourself these two questions about each network. The answer should be “yes” to both. There is at least as much relevant content on the social network as your website. You’re not just present on that social network, but you’re interacting with people, networking and building relationships. Bonus Tip! Another time you should encourage your visitors to follow a social network is after they become a lead or an ecommerce customer. Since they’ve already reached a goal and taken the desired action, why not send them to another site where they may “follow” or “like” your brand. The “thank you” page is an opportunity to get more value from the same visitors. Where There’s Traffic, There’s Hope. It’s good when people visit your social media profiles. It’s good when they follow, like and +1 you …but not when it comes at the cost of your website traffic. When a visitor leaves your website for a social network, they’re further from your lead generation form, your services pages, your blog. They’ve moved backwards, up the conversion funnel away from you. Plug the social leaks, keep your visitors and maximize your chances for the highest value interactions: leads, subscribers and customers. The fact that you saw a conversion lift is the best part. Congrats on that. It’s really just a matter of looking at everything clickable on your site …and asking if you’d really want your visitors to click that? Web design is about gently guiding visitors through a set of pages, during which they become more clear and convinced. I’m not sure how sending them to a social media site would ever help that process along. I think it’s ironic that website owners feel SM icons are necessary for a social media presence – the 2 do not go hand in hand. Absolutely! We went through the same type of thing in the mid-/late-90s with the ‘Links’ page. Thanks for the confirmation . . . I was wondering when someone else was going to see this. Mitch, “zuckerberg doesn;t need our help in getting new visitors” No doubt! It’s all a gamble. Are we going to get more net traffic from these sharing buttons than we’re losing? Sure, you may expose your site and content to new visitors, but at what cost? Thanks, Andy! I’ve been reading your posts for a while now. You nail it it every time! I’m glad you’re liking these, Steve. Is there any topic that you like more than others? Analtics? Web design? SEO? We’d love your feedback! Really interesting, thanks! My website features greyed out social icons (top right) in keeping with the colour theme. Have been thinking about asking the designer to make them more colourful, but after reading this I can see that that would be a mistake. Yes, it probably would be a mistake, since it would draw attention from your other, higher-value interactions. Ask yourself which clickable item or call to action is the most important for your business, and make that the most colorful and visually prominent. Another trick to making something stand out more… take other things away away. Keep removing visual elements from your page until it’s totally focused on that one message and one interaction that’s best for you and your visitor. I have to say it makes me think about taking the icons off our site. However, social media is a huge part of or marketing strategy and we are extremely active on it. Even after answering “yes” to both of your questions it’s giving me something to mull over. Thanks for the read Andy! 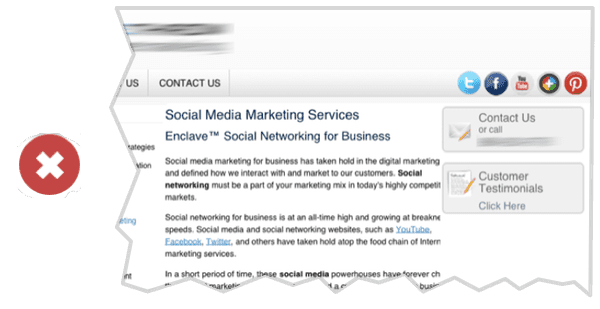 We have always encouraged our clients to place their social media icons in the footer of their website with bland colors. Like you stated – we always ask the question of why do you want them to go to your social media accounts. Your social media accounts are created to drive traffic to your website not the other way around (in most cases). Great article – good reference for clients who need more convincing. Sometimes, sending a link to an article is more effective than explaining something in person. It’s strange, but publish text (even on blogs) sometimes has more authority than the spoken voice. Seems like this is a battle I “fight” with every client. They know that SM is important so they want those icons big and prominent. That .7% click stat from YT is a real eye opener! Great post Andy! Data is one the best ways to convince clients, isn’t it? It reminds me of that quote from the movie The Untouchables …but with a twist: Never bring an opinion to a data fight! This is excellent! Great to finally see an expert who doesn’t push social media above all else. If the visitor is on our website, let’s keep them there (and make it a positive experience). Very helpful.
. . . And to think that I am just about getting those large colourful shiny SM icons for my websites! Thanks for an eye-opening article. In fact I may take down a couple of the smaller ones I have at the moment. So true. Why should I shoo my visitors off to another site even before they’ve had time to settle down in mine? I think this is a good idea. If you don’t want your visitors to click on something, why make it a big colorful button on the top of every page? But its vice versa. My traffic improved from Social Media Promotions. User landed from social media to our website because of good content & encourage user to find more interesting content on website. Of course, social media can be an excellent source of traffic. But what we’re explaining here is the problem from having big, colorful social media icons at the top of your pages. Those don’t increase traffic, they send visitors away! and what did that traffic do for you? Did it convert? This post is great. But, in my own opinion, we still need social media to promote our content. For some, it will be effective, but for others, will not. It’s just a matter of how your audience trusts your website, and what will they learn from your site. It’s not good for your marketing to send visitors away from your site to social media networks. On the other hand, it’s great for your marketing when visitors come from social media to your website! Does that make sense? Do you disagree, Tristan? Usually social media is a great option to improve the site repo but sometimes it does not work when we use very animated data. After reading that post i focused on proper seo & social media tools my overall performance have automatically starts to increase. It’s counter-intuitive because “get likes” and ” get followers” are goals for so many marketers. But “get traffic” should be a higher priority, right? We did some research recently on the top 50 marketing sites and found that 26% have social media icons in the header. That’s 1 in 4 marketers with backwards priorities! Thanks for the comment, Anita! Excellent points. “These buttons sometimes add a little ad for themselves in the shared post. 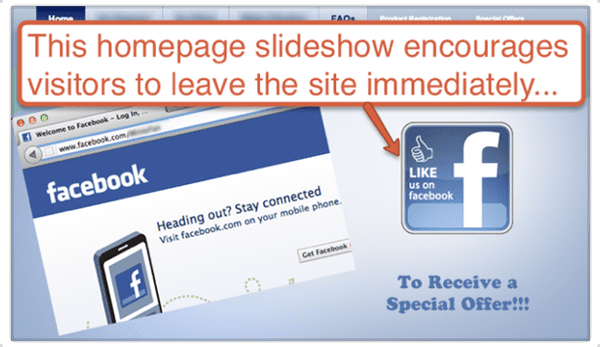 That may leak visitors away from your site and toward the company that developed the button.” I’ve always been amazed by how many sites use these, seemingly without realizing it. Sharethis gives a big fat @sharethis at the end of every tweet. How does that help you?? You’re spot on; it’s a big gamble. I’ve found for both clients and my own sites that sharing does not always directly correlate t increased traffic. 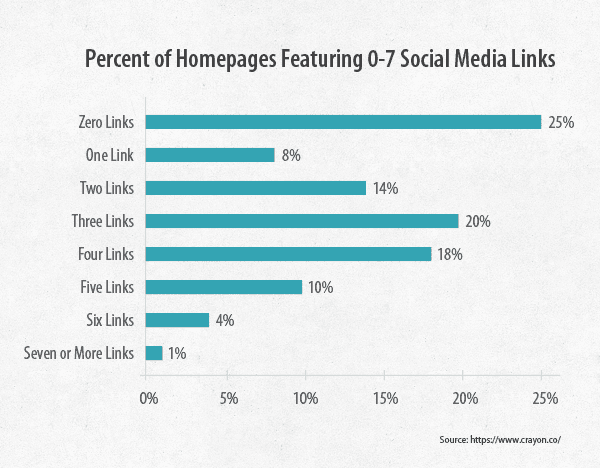 Just because one page gets 5 times more shares than another does not mean it will receive 5 times more traffic. Having social sharing buttons on order, sign up, sales, or squeeze pages is a mistake of the first order, yet more than a few organizations have them. In many cases it’s because they’re running WP sites and don’t configure their social sharing plugins correctly. You make an excellent point about keeping the big colorful buttons off the top, where they’ll encourage clicking away, and moving them to the bottom, where they’ll be seen after the content. Thanks for the timely article, Andy. Fortunately, I had not yet figured out how to put the SM links on my nascent web site, so now I can cross that off my to do list. 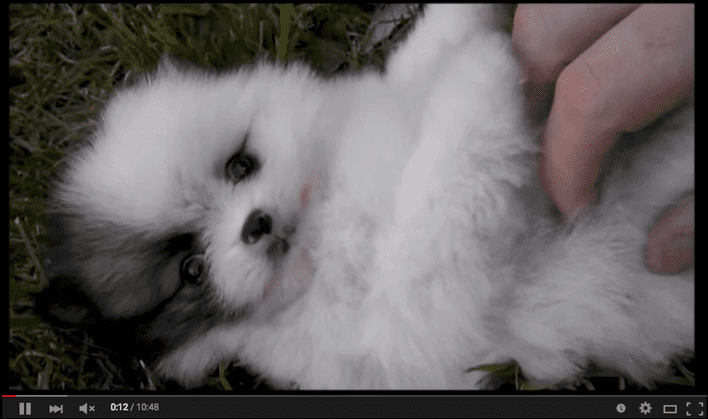 Instead, I’m going to look for a cute puppy picture to put at the top of the page (that links to nothing). Really enjoyed “Content Chemistry”!